Help us Save the Koko Crater Trail. 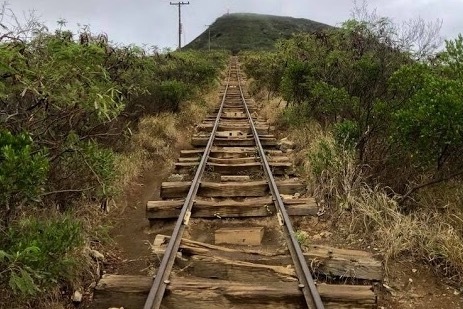 The famous Koko Crater Trail, a historic tramway to the top of the landmark Koko Crater on the island of Oahu, is on the verge of destruction by decades of unchecked decay and erosion. 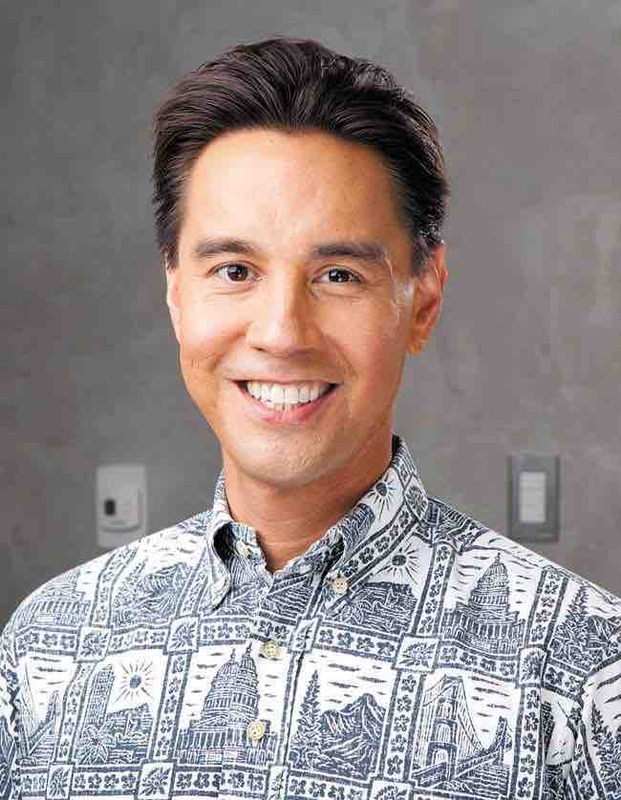 The city and county of Honolulu’s position is that there is no money, materials, or staff available for any kind of repairs, maintenance, or planning. Funds raised in this campaign will be used to pay for urgently needed temporary repairs to stabilize the trail while we, the Kokonut Koalition in partnership with the city and county, make long-term plans to completely rebuild it. Funds will also be used for startup expenses so that the Kokonut Koalition can become a 501(c)(3) non-profit organization. This will enable us to raise tax-deductible donations and to apply for grants. 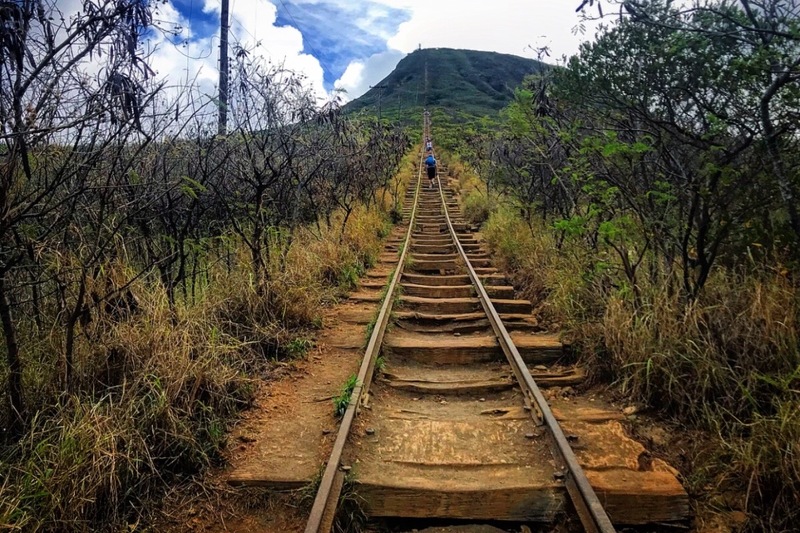 This historic tramway, now commonly known as the Koko Head Stairs, or simply the Stairs, was built in 1942 by the U.S. Army Signal Corps to provide access to an early radar station perched on the rim of Koko Crater on the island of Oahu. The tram is long gone, but the remaining track has been used as an endurance hike for decades. It rewards hikers with expansive views of Maunalua Bay and Diamond Head to the West, Hanauma Bay and Koko Head to the East, and the Waimanalo coast to the South. The tramway has been deteriorating for decades without any maintenance other than what has been done by unauthorized volunteers. 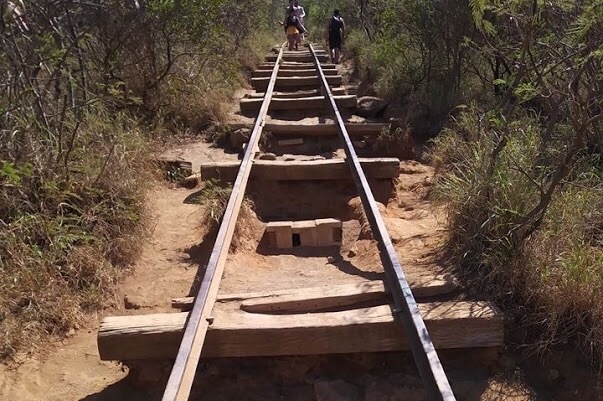 It exists in a state of benign neglect by the city and county of Honolulu, which has never maintained it and doesn’t even consider it to be a sanctioned trail. Their neglect is benign only because they allow it to remain open, though we wonder how long that policy can remain in light of the trail’s accelerating deterioration. The Stairs are now at, what we consider to be, a tipping point. 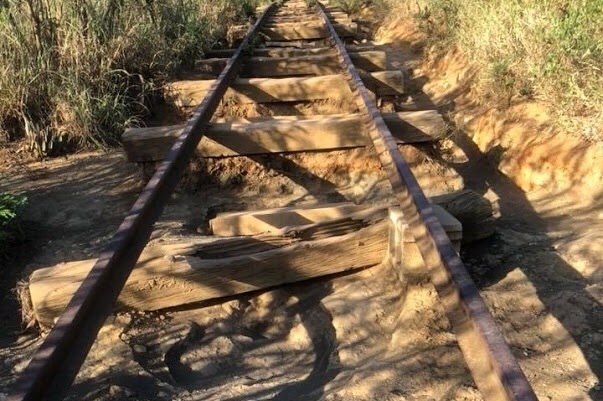 Erosion has undermined the tramway to the extent that one major tropical storm or hurricane could do enough significant damage to make it unusable. On a busy day, well over a thousand people from all walks of life and many international origins climb the Koko Crater Stairs. It has become a must-do event for our adventurous visitors. For us kokonuts, it’s our regular workout. Some of us have been hiking the Stairs for over twenty years, many for a decade or more. I’ve been hiking it regularly for four years, usually four times a week and often three trips per session. It has become a habit that sustains me. All of us regular hikers feel this way. I greet the day with this hike. Others enjoy a sunset hike and still others like to broil themselves under the midday heat of the Hawaiian sun. We feel a deep attachment to this trail and passionately believe that it deserves better treatment than it has received. The Kokonut Koalition and our supporters want this trail first be stabilized to ensure that it has a future but ultimately to be completely rebuilt. And then, in partnership with the city and county of Honolulu, we intend to hire engineers and landscape architects to produce the necessary studies and plans towards the goal of completely rebuilding the trail along the lines of the successful Manitou Incline rails-to-trail project recently completed by the city and county of Colorado Springs. In short, we hope to make the Koko Crater Trail a world-class recreational destination that the city, state, and our great nation can be proud of! Lena Haapala Haapala and I had an excellent meeting with Councilman Joey Manahan of District-7 this morning at Honolulu Hale. Manahan has become a frequent Koko hiker and is looking forward to completing his personal 7 in 10. I think it's safe to say that he's a kokonut. Jessica Caiazzo recruited him right off the trail. Good work, Jess! It was very generous of him to give us an hour of his time. We explained our history and the current state of affairs. He offered his help and said that he'd meet with Councilman Ozawa to discuss strategy right after the meeting. He also said would talk to Mayor Caldwell about the project. Thank you, Councilman Manahan. I know that a lot of you are frustrated with the time it's taking to get some simple trail repairs done. We share your frustration. I can assure you, though, that we are making progress. There are a significant number of hoops we must jump through in order to get the city’s permission to do any work. But we are jumping. Our last meeting on November 23rd with DPR and DDC has clarified the process we must go through. DPR Director Nekota kindly delivered to us sample proposals from other Public/Private Partnerships that we can use as templates. We need to enter into a legal agreement with the City. This will probably take the form of a Memorandum of Understanding. Before we can do this, however, we must be a legal entity. Receiving nonprofit status can take 6-months or longer. The Livable Hawaii Kai Hui has generously offered us an Interim fiscal sponsorship to fill the gap. We will propose to them a Memorandum of Agreement. If accepted, we’ll be able to solicit tax-free donations and apply for grants earlier than we would otherwise. Once incorporated and sufficiently insured we can offer the City an MOU to enter into a relationship relating to Koko Crater trail improvements. After the MOU is agreed upon and accepted we can submit a proposal to the City for the work we wish to do. Initially, this will be for erosion control and trail repairs. It's unclear at this time how detailed this proposal will need to be. I imagine we’ll learn by trial and error. NOW, THEREFORE, BE IT RESOLVED, that the Honolulu City Council authorizes acceptance of this donation of $10,000 worth of lumber, gravel, gabion baskets, sand bags, railroad ties, miscellaneous hardware, blood, sweat, and tears to the Department of Parks and Recreation. After that, God willing, we can all have a party--a work party! I had a nice phone meeting with DPR Director Michele Nekota this past Friday. We chatted about a number of things. I was a little surprised and very happy to hear that, according to her, the City is moving forward. I was actually a little nonplussed. At the last City Council Parks Committee meeting on Sept. 18, she had assured me that they were taking Koko Crater Trail seriously and that they were looking forward to working with us but, I have to say, I remained skeptical. It appears she was serious, but you be the judge. Michele had previously requested that the City Dept. of Design & Construction, the DDC, inspect the trail and return with recommendations and an estimate of repair or rehabilitation costs. I’m not sure if their report is complete but she indicated they said it would be impractical to repair or restore the tramway as it is. Instead, she said they recommended that it be redesigned and rebuilt as a trail. Michele had previously delivered to the DDC the Manitou Incline CASM presentation pdf by Don Jacobs, the project engineer. It appears that the DDC agrees with the rail-to-trail approach that the Incline project took and that the Koalition has been advocating. This is good news as it means a wider, safer purpose-built trail with a greater capacity. Michele said that she including money for the project in her 2019 budget. 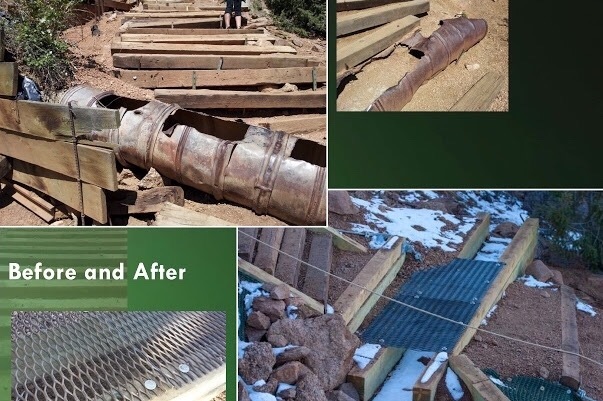 Though she didn’t mention a figure during this conversation, at the last Parks Committee meeting, we had talked of $5M as a working figure, it is a third of the Manitou Incline project’s cost of $15M. The MI is about three times as long and has almost three times the elevation gain. She said she padded the amount for design costs. It’s important to understand that these are just budget numbers and are somewhat meaningless without an actual plan and project scope. But it’s a very good start. Michele warned me, though, that even though she’s requesting funding for the project, the request could be cut by the Department of Budget and Fiscal Services, the City’s budget watchdog. Michele said that almost everything, including relatively minor trail stabilization efforts, and this is important, cannot proceed until SHPD makes its determination. She says this process will also determine if an Environmental Impact Statement / Report will be required. Needless to say, this could take some time. When asked what the Kokonut Koaliton’s role would likely be in this process she again mentioned the KK being the private partner in a public-private partnership (P3). When asked for clarification, she said that it would be much more expensive and would take much longer for the City to complete this project than it would be for a private party like the KK. She cited a few recent park projects where the private partners did essentially everything from raising funds to hiring engineers and architects to enter into contracts to build the project. She sees this as our role. She also suggested that the KK could take on the responsibility of maintaining the trail, once built, perhaps with the help of the military who she has had conversations with. As you know we are moving forward to become a non-profit corporation. Ordinarily, we would have a difficult time raising funds before we become a 501(c)(3,4) but we have recently been offered interim fiscal sponsorship by the Livable Hawaii Kai Hui ( www.hawaiikaihui.org), a 501(c)(3) corporation responsible for many good works in the area. The Hui will provide an umbrella under which we can operate as a non-profit until our applications are approved. They will be responsible for the funds we raise keeping them in trust for our authorized use. This is an extremely generous offer for which I am grateful. Thank you to Elizabeth Reilly and the Hui Board. I think this conversation with Director Nekota represents a turning point for the Koalition. Prior, we were a lobbying organization trying to get the city to recognize the trail as the unique asset it is and to convince them to fix it. After, we appear to be a fundraising and project management organization. I don’t know about you folks, but I am encouraged. This evening I attended State Representative Gene Ward's October 2018 Beer Summit at the Greek Marina Restaurant in Hawaii Kai. I introduced the Kokonut Koalition during the open issue session and outlined what we represent. There were about 20 people attending. Gene Ward received my comments enthusiastically and informed the audience about our presence and testimony at the recent Hawaii Kai Neighborhood Board meeting. 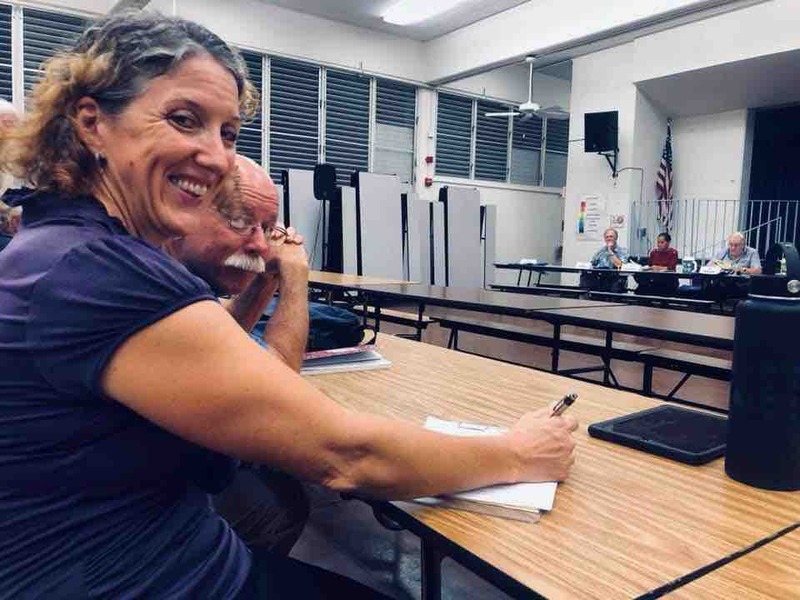 Marian Grey (Hawaii Kai Neighborhood Board Subdistrict 2 Member) also attended this evening and commented about how we can work together with Livable Hawaii Kai Hui to help get the Kokonut Koalition established and moving toward a solution to the trail problem. It was a great opportunity to learn more about the issues that affect Hawaii Kai, Honolulu, Oahu, and Hawaii as well as to introduce the Kokonut Koalition's desire to restore this beloved trail that is being loved to death. I’m Drew Murphy, president of the Kokonut Koaliton. But Eventually we want to completely Rebuilt it. How many of you folks have hiked the trail? 1928 - Bishop Estate gave the site to the City with the request that it be used for recreational purposes. 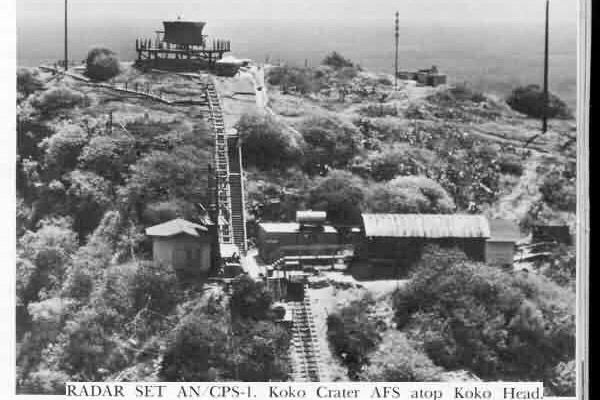 1943 - The tramway was installed by the Air National Guard to build and service an early warning radar station on the rim. 1965 - The Air Force returned the property at the foot tramway to the city and it became the Hawaii Job Corps center. 1966 - The radar site and the tramway were also returned to the City. 1968 E.K. Fernandez wanted to build a restaurant atop the crater with a gondola ride. February 2008, Mayor Mufi Hannemann closed the trail but, after a public outcry, reopened it the same day. June, 2012, Hawaii News Now airs a piece on the rifle range and stray bullets. We support the proposed safety measures. March, 2014, a spokesman for Mayor Caldwell, said his boss wants “continued public access at Koko Crater,” but wishes there were a way to reduce the high number of rescues. December, 2015, President Obama wishes hikers a Happy Holiday. May, of this year, In desperation after watching the trail deteriorate, the Kokonut Koalition is formed. August, 8, Hawaii News Now airs a piece on the trail and the us. August 24, we meet with Parks and Recreation staff. August 29, Director Nekota says the City welcomes collaboration through public-private partnerships . . .
Last Tuesday ,9/18/2018, we testified before the City Council Committee on Parks, Community and Customer Services. Director Nekota expressed gratitude for our efforts and said that the administration was looking forward to working with us. 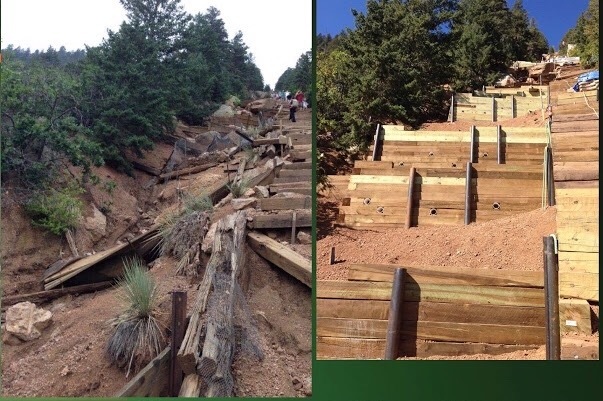 with the goal of completely rebuilding the trail along the lines of the recently completed, very successful Manitou Incline rails-to-trails project in Colorado Springs. The speed of the water is controlled by the cross-ties acting like dams. As the water velocity eventually slows further, finer sediments fall out of suspension, all backfilling behind the cross-ties and creating the steps that we hikers use. When this happens, typically one side of the cross-tie slides down the rail so that it is lower than the other side. And this creates a chute. Thereby Increasing its erosive power exponentially.